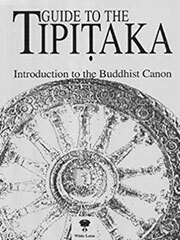 The Tripitaka (Sanskrit, lit. three baskets), Tipitaka (Pāli), or 三藏 (Chinese: Sānzàng; Japanese: Sanzo; Khmer: Traipětâk ត្រៃបិតក; Korean: Samjang 삼장; Thai: Traipidok ไตรปิฎก; Vietnamese: Tam tạng) is the formal term for a Buddhist canon of scriptures. Many different versions of the canon exist throughout the Buddhist world, containing an enormous variety of texts. The most widely-known version is the Pali Canon of the Theravada school. The Tipitaka writings, which were originally memorized and recited orally by disciples, fall into three general categories and the scrolls (originally written on palm leaves) were therefore kept in three baskets (tri-pitaka). The second category, the Sutra Pitaka (literally «basket of threads», Pali: Sutta Pitaka), consists primarily of accounts of the Buddha’s life and teachings. The Sutra Pitaka has numerous subdivisions: it contains more than 10,000 sutras. The third category is known to the Theravada school as the Abhidhamma Pitaka. It is a collection of texts in which the underlying doctrinal principles presented in the Sutra Pitaka are restated and explained in more a systematic framework. In Mahayana and Vajrayana tripitakas, this pitaka often contains treatises that are referred to as shastras. The Chinese form of Tripitaka, «Sanzang», was sometimes used as an honorary title for a Buddhist monk who has mastered all the Tripitaka cannons, most notably in the case of the Tang Dynasty monk Xuanzang, who was portrayed in the novel Journey to the West as «Tang Sanzang». Due to the popularity of the novel, the term in «Sanzang» is often erroneously understood as a name of the monk Xuanzang.